The Three and partners got together before Christmas to sample the stuff over at Rambla, a new Spanish place over at Rockwell. Taking over what used to be Lu. Or LuLu. LuLuLu? Rambla has a few crafted cocktails on their menu and Kitchyart had tried a couple. I found them on the sweet side and just stuck with the bottles of wine we brought. 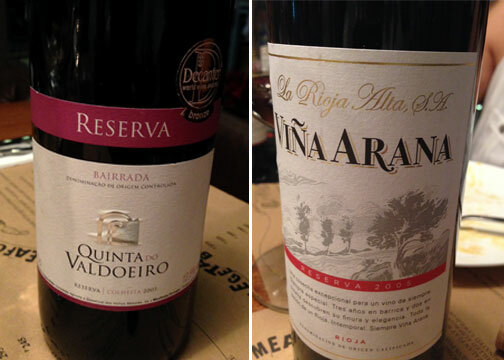 A fruit/berry forward, medium bodied Douro Reserva and C’s Rioja Reserva; notes of leather, smoke with that slightly sanguine quality. Both went quite well with the meal. 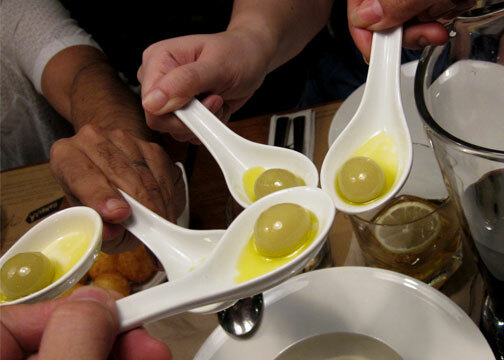 We had managed to sample a few items, first being the spherified olives which every table seemed to be having. Peer pressure? Essentially pureed olives reformed into…olives. Or exploding olives. An El Bulli signature; but I would assume more democratic here at just P45 per piece. Not that I ever had the chance to compare with the original. Though I wouldn’t have minded some actual good olives on the menu as well. 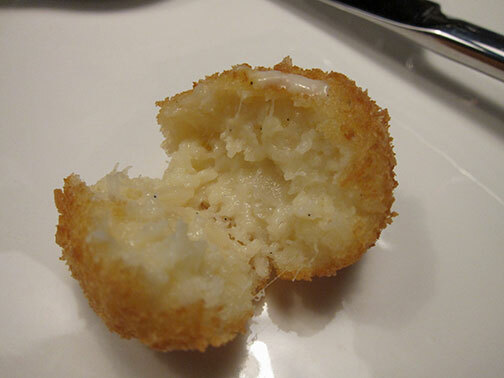 Cod Croquetas with Bourbon Vanilla. Crispy crust with creamy béchamel insides. Nice texture. There wasn’t a strong cod or fish flavor though; and only a hint of the vanilla in the background. I think this is one of the few places I’ve been to (save for breakfast places) with a menu highlighting eggs. We had tried two of three selections. 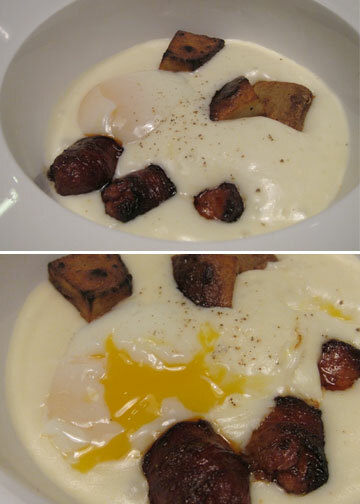 The Organic Eggs 65°C, Chistorra and Potato; a runny egg buried in a luxuriously smooth potato puree and topped with pork sausage bits. Deliciously comforting. There seems to be a scotch egg trend going on around the metro and Rambla’s version would be the Organic Egg Bomb Butifarra and White Beans Cream. 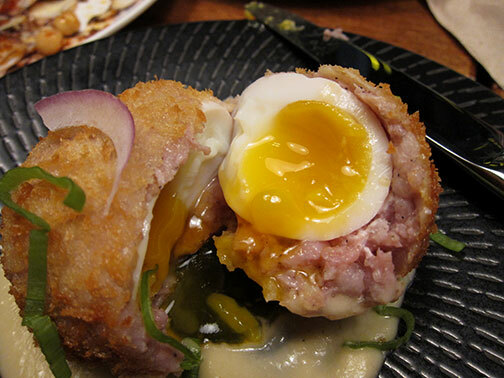 An egg wrapped in sausage meat then deep fried, then propped on a pool of a velvety puree. It is a sight to break open and see the yolk ooze. Flavors were surprisingly mild. I was expecting more salt from the sausage crust. We also tried the Ricotta Gnudis with Seasonal Mushroom Sauce, Rosemary and Hazelnuts. 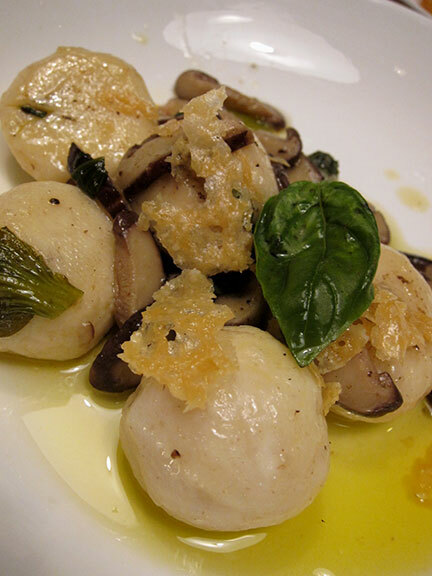 Essentially gnocchi made with ricotta; pillowy soft with neutral profile leanings. You have to get some of the accompanying components to really give it any flavor. Up next was the Inside Out Cannelloni with Wagyu and Smoked Aubergine. Sort of fell flat in all its phallic glory. The beef log was a tad on the dry side and wasn’t much without the creamy sauce. And by this time I think our palates were getting fatigued by all the cream sauce pairings. 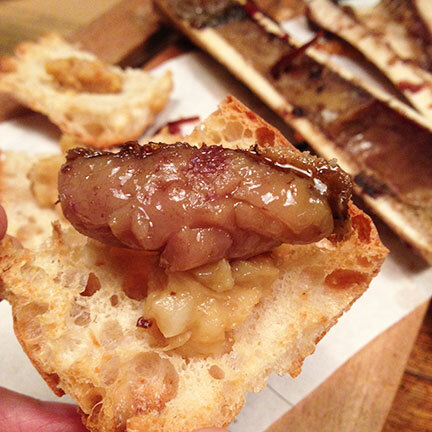 The Roasted Bone Marrow with Crispy Onion and Toasts with Garlic Cream was good though. The bread was nice and crusty, the garlic cream adds that sweetish edge. I don’t think they brine the bones overnight before roasting though as the bits of protein and blood are still visible. And did have that slightly bloody note similar to that of dry aged steaks. Not a bad thing but some people may like it more than others. Paired perfectly with the Rioja though. 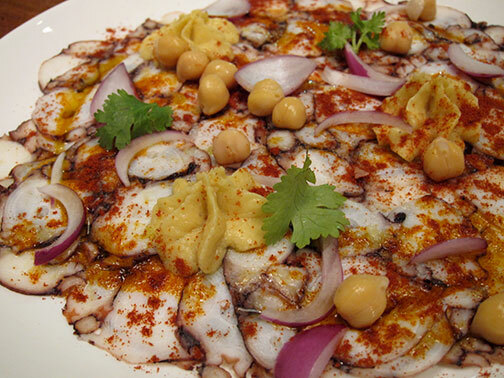 My favorite dish of the night would be the Octopus Carpaccio with Hummus, Red Onions, Coriander and Sweet Paprika. It takes forever to cook octopus to attain this tenderness. And plated beautifully in wafer thin slivers. I love the sprinkling of paprika, pipings of hummus and the sharp punctuation from the raw onions. Nicely rounded off with a drizzling of olive oil. Overall, it was a good first impression. Not bad. 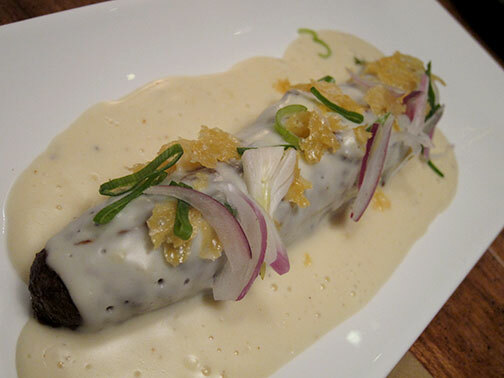 There’s a clear picture of what comfort food is to Chef Pepe; a walk on the mild side with analogous silken textures. Of course served with his creative twist and beautiful plating. Shall we say a tiny glimpse of the inventive things they do with their food in Spain. Without the hefty price tag attached to stars. I wouldn’t mind a return visit.